Pitiable, a lamentation to once great nation wobbling on rickety spindly legs. Are you trying to push for a remix of ‘the land is green’? It is indeed sad buh herein lies (y)our responsibility…shall we continue to talk about the insensitivty of our govt? Shall we continue to talk about how dis ‘forced’ union we call nigeria is headed for doom? Shall we yet talk about how our unique diversity is killing us? Sand means nothing to the desert dweller, no more than ice to the eskimos! Stating the obvious helps in no way! Creative minds like (o)urs should be put to work…I’ve always loved ur write-up’s…but dis…dis is not d time to loose hope nd make people stop believing! Talking about war in a time of war yet keeps our focus on war! 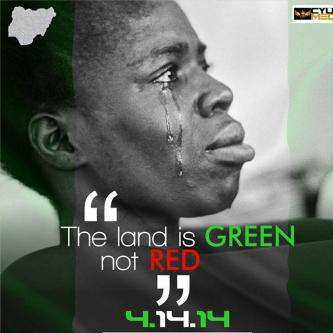 Its time 4 a new message…we are nigerians, we survive! Waters ability to cut stone results from consistency, not pressure!!! Let’s keep hope alive, ur message means something to someone somewhere. Reblogged this on Naijaboytoby's Blog. I shake my head for this nation. What’s the hope of the masses in this country. We’ve been hearing and hoping to see a better Nigeria but I guess better Nigeria is still very far from us right now. I weep for this country.